The simplest method of beam and joist framing is to have the joists on top of the beam (Fig. 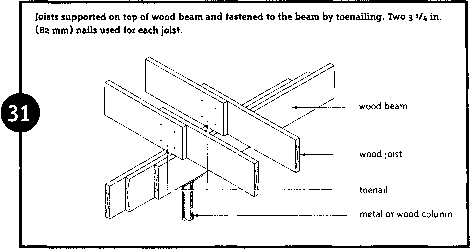 31), in which case the top of the beam is level with the top of the sill plate (Fig. 30). This method is used where the basement must have adequate headroom below the beam. 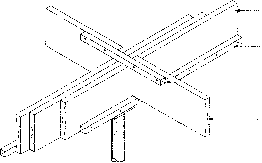 Where more clearance under a wood joist is desired, joists may be supported by joist hangers or other structural connectors attached to the beam. 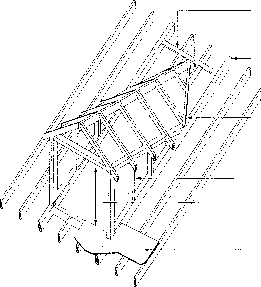 In lieu of joist hangers, the National Building Code allows joists to be supported on ledger strips attached to the wood beams (Fig. 32). The 2x3 in. (38 x 64 mm) ledger strip is nailed to the beam with two 3 1/4 in. (82 mm) nails per joist. 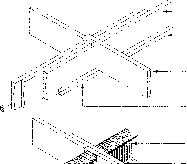 The ends of the joists may be spliced or notched as shown in Figures 32 and 33.
mm) ledger strip bolted to the web with 1/4 in. (6.3 mm) bolts spaced 24 in. (600 mm) on centre. The joists should be spliced (Fig. 33) and a 1/2 in. (12 mm) space provided on top of the beam to allow for joist shrinkage. Joists supported on ledger strip nailed to beam with two 3 1/4 in. (82 mm) nails per joist. Splice nailed to joists with two 3 1/4 in. 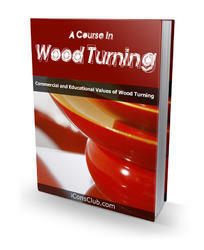 (82 mm) nails at each end. Joists supported on ledger strip nailed to beam with two 3 1/4 in. (82 mm) nails per joist. Joists lapped and nailed together with two 3 '/4 in. (82 mm) nails. When a steel beam is used, joists rest on the bottom flange, or a wood plate which is bolted to the beam, and are joined at the top with a 2 x 2 in. (38 x 38 mm) splice.